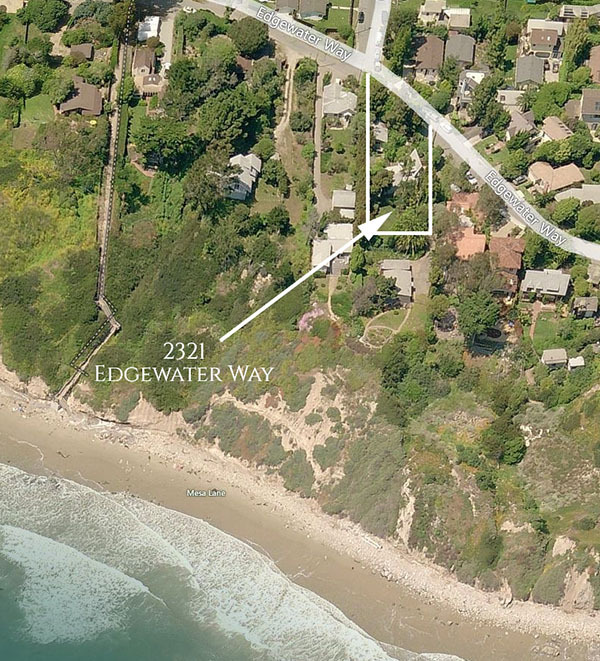 2321 Edgewater Way has closed escrow for $1,900,000 in a private sale. 2321 Edgewater Way is a modest 1950’s 1,605 sq.ft. two story A-frame with fireplace, peeks of the ocean and a detached 2-car carport. It is not on the oceanfront, but is on the ocean side of the street and has access to the beach via the nearby Mesa steps. The property consists of 0.33 acres and has an oceanfront home in front of it. 2321 Edgewater Way sold in October 2017 for $1,900,000 in a private sale without coming on the market. 2321 Edgewater Way sold as a fixer in February 2014 for $1,325,000 and in March 2000 for $750,000.